In this tutorial, you will learn to control flow control of a program using c programming if statement. Normally, statements in a program are executed one after the other in the order in which they are written. This is called sequential execution. But sometimes, along with the program, the order of execution needs to be changed or the programmer must know how to change the flow of the program. For this C provides control statement if and if..else to control the flow of program. It’s a one-way branching in which the statements will only execute if the given expression is true. 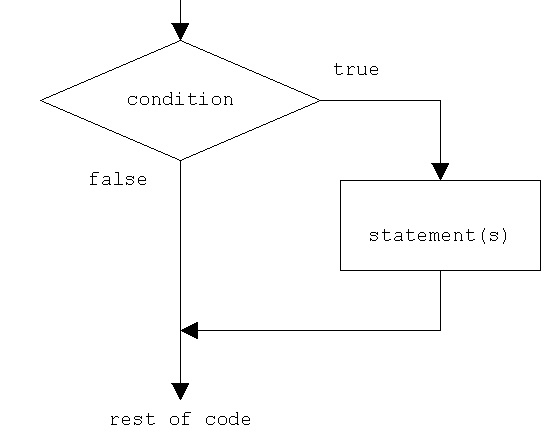 Here, statements will be executed only if the expression is true. if..else statement is used if we want to execute some code if the condition is true and another code if the condition is false. Here, if an expression is true then statement1 will be executed , otherwise, statement2 will be executed. Here, if the expression is true then statement1 will be executed otherwise, statement2 will be executed. Properly indent each level of if...else statements. Type beginning and ending of braces and then write statements between them. if...else if...else statement is used to select a particular block of code when several block of codes are there. Here, statement1 will be executed if expression1 is TRUE, statement2 will be executed if expression2 is TRUE and if none of the expressions are true then statement3 will be executed. Note: Syntax error is detected by the compiler whereas logic error has its effect at execution time.